Stop by for fresh, baked-to-order pizza, hot wings, sweet and sour wings or lemon pepper wings. Golden fried chicken tenders, French fries and other daily specials such as nachos, chili, soup, and build-your-own baked potatoes are also available. We’re ready to craft your favorite fresh sandwich just the way you like it. Choose from tuna or chicken salad, ham, roast beef, turkey and more. Try it baked or as a wrap! Our short-order grill features a 100% pure beef hamburger, juicy hot dogs and smoked sausage, and tender chicken or fish sandwiches. All options are served with your choice of fries or chips. Look for daily specials such as Philly cheesesteak sandwiches, grilled cheese combos, or chili-cheese fries. We’ve expanded our Fresh and Fit Salad Bar and it’s loaded with healthy and satisfying options for students looking for a light meal. Start with a base of crisp iceberg, romaine or mixed field greens and top with a selection of your favorites, including fresh vegetables, seasonal fruit, pasta salad, olives and cheese. We continue to prepare a traditional meat-and-three meal each day with a rotating menu of home-style favorites such as fried or baked chicken, pork chops, and fish. Other favorites include hamburger steaks with onions and peppers, lasagna, baked spaghetti and meatloaf. We carry a full line of Coca-Cola® products and a variety of snack selections for those in-between meal breaks. All students are required to pay for meals. Meals can be purchased at the point of sale in the cafeteria where receipts are provided. 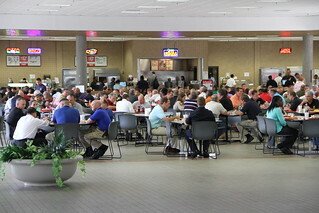 The GPSTC cafeteria accepts cash, Visa, MasterCard, and debit cards with a Visa or MasterCard logo. Agencies purchasing meal tickets are encouraged to do so no later than noon on Friday of the week prior to training, however, meal tickets are also available for purchase during regular business hours from the Front Desk or the Fiscal Services Division. There are three meal plans available. Pre-Payment by Credit Card or Check: Agencies that wish to pre-pay with credit card or check can contact Registration at (478) 993-4225 or 4458 for telephone receipt of credit card information or details for sending a check. Invoice: Agencies may be billed for meal tickets on a monthly basis. Agencies that wish to be invoiced may contact Accounts Receivable at (478) 993-4403. Please Note: Meal tickets should be requested no later than noon on the Friday of the week prior to the student arriving in order to receive the full plan. Once a meal ticket is requested, agencies will be charged the full amount, per day, for the meal plan selected. Meal tickets are non-refundable. We do not track usage on meal cards and we do not issue credit for any uneaten meals. Students who lose their meal cards must pay a $5.00 “lost card” fee and be issued a new card. Credit card orders may be placed by contacting Registration at (478) 993-4225 or 4458.